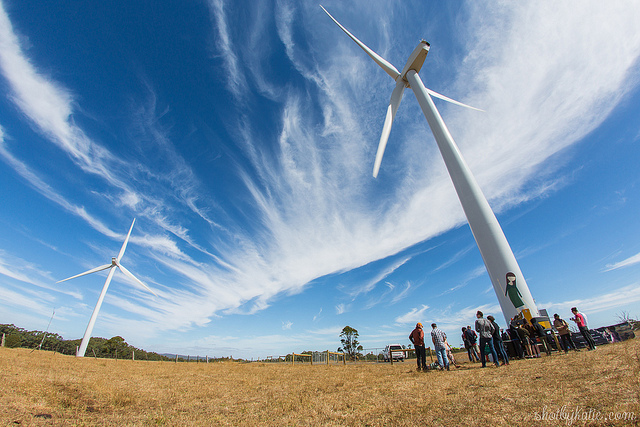 The community-owned Hepburn Wind Farm, located in the seat of Macedon. The seat of Macedon was previously united by uniform planning laws that enabled community engagement in the development process. But since 2011, the region has been subjected to smothering regulations. 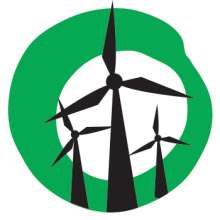 A large-scale blanket ban on wind farms cuts across the electorate. On August 30, the third anniversary of the Coalition’s anti-wind farm laws, Yes 2 Renewables, the Macedon Ranges Sustainability Group and community members gathered on the border of the “no-go zone.” We sought to demonstrate the arbitrary nature of the Coalition’s wind farm ban. I would like to add my voice to the handsome mob who turned out to protest the arbitrary wind turbine ban on our shire (‘Dump the ban‘, September 2, 2014). The wind in Woodend blows cold and often. Just three turbines could power the towns of Woodend, Newham, Macedon and Mt Macedon, according to data collection by the Wise Wind group. Hepburn shire residents have been reaping the benefits of their two turbines for the past three years, keeping their energy green, their money in the community and their neighbours happy. There’s an election coming this year, and I’ll be sure to ask my local candidates which way the wind blows for them prior to casting my vote. If you, like Elvira, feel like renewable energy has a place in the Macedon ranges why not get involved? Where: Starting at Black Forest Timber Mill on Black Forest Drive to the site of proposed community-owned wind turbines in the pine plantation off Fingerpost Road. There will be a photo opportunity before the return ride to Black Forest Timber Mill. (13km round trip). RSVP: Book your tickets now at www.mrsgonline.org.au/r4r and share the Facebook event here. Contact: For further details contact R4R@mrsg.org.au. Want to ask your candidates about the issues that matter to you? 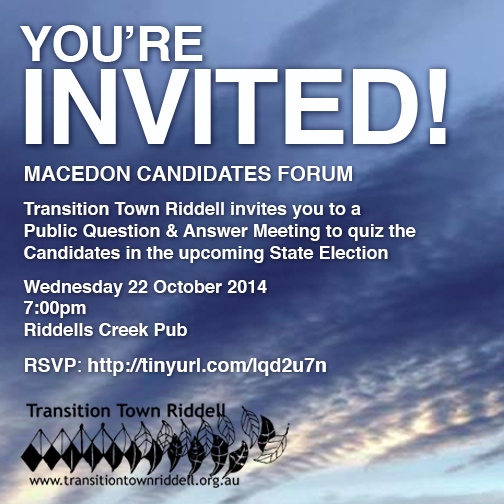 This is your chance.We’re told Transition Towns Riddell will host a election forum featuring Labor, Liberal and Greens candidates for Macedon. This will be a rare chance to see compare and contrast the policies of major party candidates. When: Wednesday 22 October, 7pm to 9pm. RSVP: Book your tickets now on EventBrite and share the Facebook event here. I also think the blanket ban should be removed, however the 2km buffer from a turbine must remain! Again, survey those that will actually be impacted by turbine placement not those that pontificate from a distance.